My daughter and granddaughter have been staying with me the past two weeks, along with other family members popping in and out plus I have a good friend's sons wedding to help decorate for and attend, so I have been super busy and very over-whelmed. It's been a fun two weeks that I wouldn't trade for anything, but I've really been struggling keeping up with everything, especially my blog. I've had no time to take and edit professional photos of outfits, so I decided to do a "Instastory Round-up" post instead. These are all outfits I wore out for lunch, shopping, running errands, or to church. 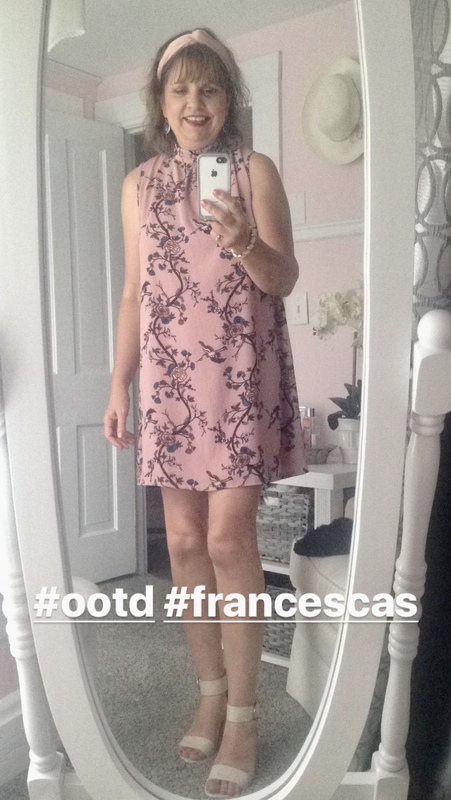 I took selfies and posted them in my Instastories on Instagram, but I never did a formal fashion post on these outfits; mostly because they are old outfits that I probably showed you before. 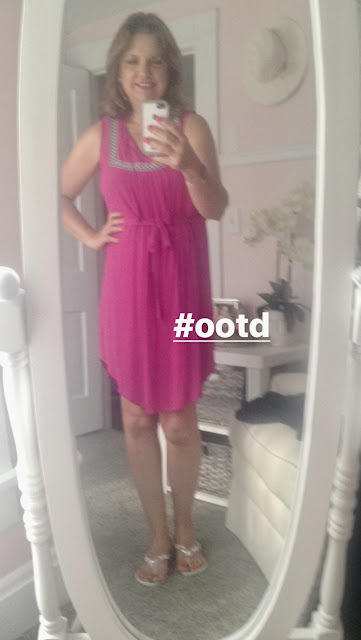 This is a Liz Claiborne dress I wore on a hot day to meet my husband for lunch and shopping. I wore this pretty bird print dress from Francesca's to church. I added a coordinating blush headband and blush jewelry. 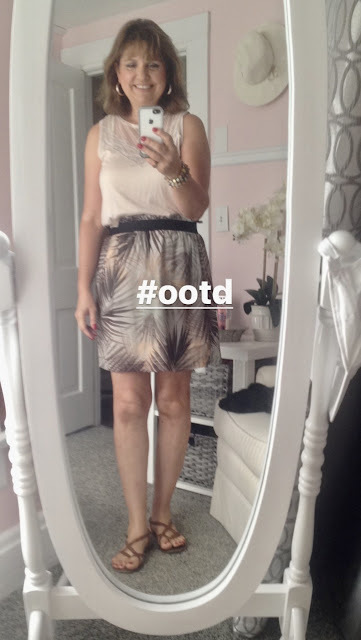 Another outfit to wear shopping and lunch with hubby. It's a denim pencil skirt with a plaid, sleeveless gauze top. The weather cooled down a bit for awhile, so I pulled out my white jeans when I went shopping. 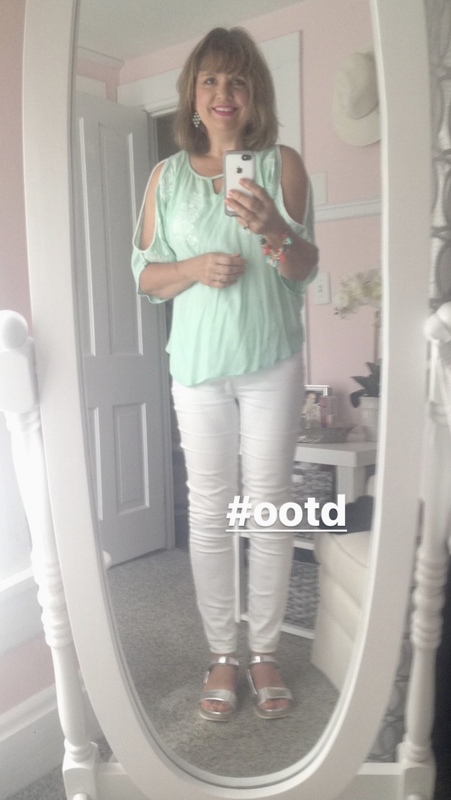 My mint cold shoulder top is from Ross. I wore my comfy, silver athletic sandals for a long day of walking! And finally, this is an outfit I wore when we took my granddaughter Alethea to a local park. 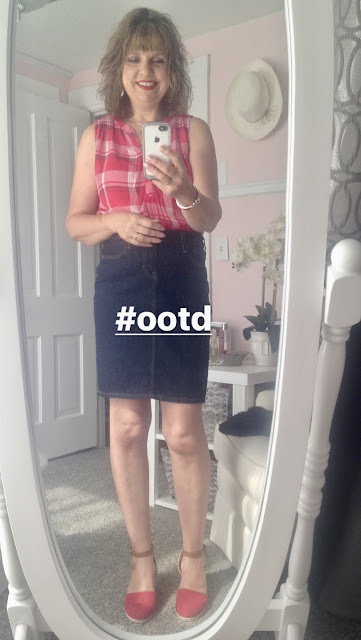 IF I remember, I try to post my daily outfits on Instagram in my Instastories every Wednesday and Sunday. Unfortunately, most of the time I'm in a hurry to get out of the house and I forget...haha! If you're interested in my daily outfits, you can follow me on Instagram HERE! Cute and cool outfits, Amy. I'm having to do selfies at the mo and your selfies are light years ahead of mine! Hugs, x. So many cute looks, Amy! You look adorable in that headband and pretty floral dress. Love the plaid shirt and denim skirt combo! Such great summer outfits Amy. Esp. LOVING the last one - such a pretty skirt and you picked the perfect top to go with it. I am always struggling on what to wear with skirts! Thanks Ellie! I think it's a challenge finding tops to go with skirts too, but I like that you can style skirts so many different ways whereas dresses aren't that versatile. That neutral palm print skirt is darling and I have just been loving Francesca's lately for shopping... that dress from there is so cute! Thanks Carrie! Francesca's has the cutest things. That Liz Claiborne dress is so cute! Thanks Mica! I forgot so many times the past two weeks to share pictures!